I am writing this for all of us who are dealing with hot temperatures and also for those who will be starting Ramadan. The most important thing to do in heat is to hydrate your self with WATER. Please see the links below because if you believe the corporate lies that Gatorade, Powerade, Vitamin Water, flavored water, juice or soda can hydrate you, you are highly mistaken. The best thing to do if you plan on being in the heat is to hydrate in the morning with 1 teaspoon of pure sea salt in a bottle of water to begin your day. Maintain a constant intake of water throughout your day. For those doing Ramadan, please make it a priority to drink water in the morning before sunrise. You can start with sea salt in the first bottle followed by 1 or 2 bottles more. The sea salt should not have any other ingredients in it. The salt helps pull the water into the tissues and into the cells which makes the water maintain in the body for a longer time. We SHOULD NOT concentrate on replacing our electrolytes through drinks. GOD hasn't made any water on His planet that we should be drinking with enough electrolytes to replace what we lose in sweating, breathing or urinating during strenuous activity. Electrolytes should be replaced in food such as fruits, vegetables and also cooking with sea salt. The ocean is the only source and I think we all know what would happen if you drank that type of water all day! On the evening side of our days in Ramadan we should also drink water before eating our meals. The digestion process can't happen well without water. The cleansing of the body through the liver and kidneys can't occur when the body is dry. Very similar to the earth. All of these areas in America that are in a drought is a sign of how the body doesn't work without water. So please hydrate yourself well and avoid the dangers of heat exhaustion or heat stroke. There have been plenty of deaths already this summer because of these dangerous problems so please don't believe it can't happen to YOU! Many of the young children that are dying while playing sports are due to improper knowledge of nutrition. The many colors of different fruits and vegetables that are in the grocery store represent different nutrients and vitamins that the body NEEDS to do its daily processes. You cannot get those nutrients from hamburgers, hot dogs, burritos, fried chicken, noodles, chips, hot fries, candy or soda. You need to eat plenty fruits and vegetables to be healthy as a human and if you add the athlete’s schedule, it takes more than the average person. BUT, the biggest problem is hydration. Most athletes think that Gatorade, PowerAde and Vitamin Water are good replacement drinks. THEY ARE NOT. These drinks have a lot of coloring and additives that are not natural and they will not hydrate you as well as fruit juice and water. The blue, red, orange, green and so on colors of these drinks are man made food colorings. You do not see these colors come out in your urine nor in your stool so that is another thing the body has to work hard to deal with. The colors in fruit juices are used by the body to help it exist. It is important to hydrate yourself during the game but it is most important everyday as well as before and after the game. The heat in the summer is the source by which we lose most of our fluids. We lose fluid when we sweat and when we breathe in addition to urinating. My suggestion would be to drink mostly water (should be bottled because we cannot trust tap water) and periodically through the day drink 100% fruit juice (orange, apple, grape, grapefruit, cranberry etc. ; organic would be the best). 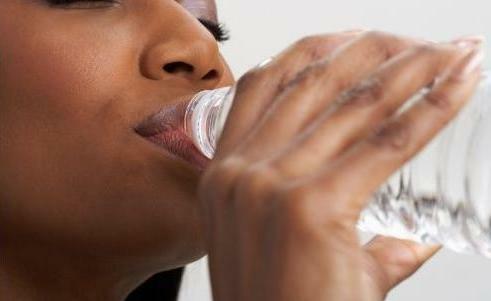 A lot of medical people suggest that people drink 8 eight ounce glasses of water per day. That is not good information. People come in all different sizes and shapes. The only way to determine whether you are drinking enough water/fluids is to watch your urine every time you go to the bathroom. Your urine should be as close to clear as you can get it. If your urine is yellow, dark yellow or orange, your body is dehydrated. Give your body what it needs and drink more water. Some coaches and schools have agreements or contracts with these drink companies, so some schools will have plenty Gatorade and PowerAde around. You would be better off bringing your own fluids. Great post. Another great way to hydrate is to "eat" your water with foods such as fruit, vegetables and soups. The body absorbs it much better and over a longer time period, so it does make sense to include as much of these foods in evening meals.